Then, one night, Nicole is killed. Toni and Ryan are convicted of her murder and sent to prison. Nicole's killer--or killers--not only took the life of their victim, but effectively Toni and Ryan's as well, and the young love they shared: once out on parole they will never be allowed contact again. Toni and Nicole's parents' lives are ruined as well. Their mother holds onto her rage against her elder daughter, and their father's indecision about whom to support ends up supporting no one. 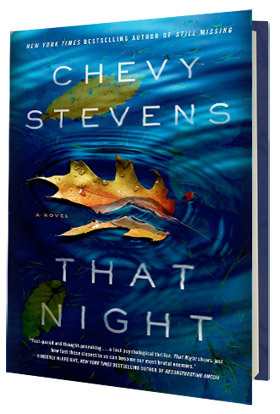 Seventeen years later, Toni is being processed out of prison and into a halfway house when we meet her in the opening lines of That Night, the fourth novel by Chevy Stevens (Still Missing). She is frightened and unsure of how she'll readjust to the outside world. It was so painful on the inside--being separated from Ryan and everything she knew--that the only way she could cope was to shut down. She stopped writing to Ryan in the men's prison, asked her father to stop visiting and got into a lot of fights. Now that she's out, her fellow parolees at the halfway house want to continue with violence, and Ryan wants to renew contact. He's intent upon solving the crime they've been convicted of, but violating the parole conditions that forbid contact could land both of them back in prison; anyway, Toni feels the best way to move on is to put Nicole's murder behind her. In returning to her hometown, however, she finds that no one else is ready to do that. Her mother is still furious, believing Toni killed her little sister; her father is still unsure whose side he's on; it's nearly impossible for an ex-con to get work, and even harder for her to keep it. And Toni's high school nemeses, Shauna and her henchwomen, are still around, and still have a bone to pick. She makes just one friend: a rescue pit bull named Captain. Slowly, Toni begins to settle in. Back in Campbell River, she goes to work at the Fish Shack, where she waited tables in high school--now they keep her (and her prison tattoos) hidden away in the kitchen. She lives with Captain on a small boat and checks in with her parole officer daily. Toni has now experienced severe bullying, incarceration and an egregious failure of the criminal justice system; at 34 years old, she'd like to just be left alone to put together whatever life she can. She doesn't visit her parents, but she does see Ryan hanging around the marina where she lives. He's pushing ahead in investigating Nicole's death, against Toni's advice, and he has his eyes on the girls who picked on her in high school--Shauna and her clique testified against Ryan and Toni at the trial, and Ryan wants to know why. What really happened that night? As Ryan's investigations approach the truth, the events of 17 years ago feel very recent indeed; Toni may be in danger--and she may not be the only one. That Night shifts back and forth between the events of 1996, when Toni's teenaged world fell apart, and the present, with Toni newly released from prison and struggling to rebuild her life. Both are told in first person by Toni herself, although in two subtly different voices: that of the rebellious teen with short-term concerns and long-term dreams, and that of the ex-con whose hard-won and carefully constructed defense system is still brittle. This nonlinear style highlights Toni's sense of confused and harried apprehension, of disruption. Flashbacks allow the reader to visit Toni behind bars, and these scenes, too, are evocative and disturbing. This is your fourth novel. Is it getting easier, or harder? 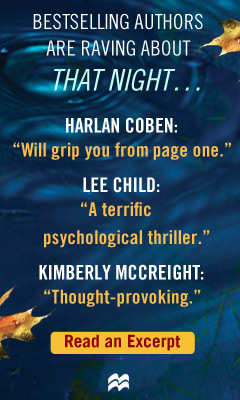 I really enjoyed writing That Night, and even though it still had some challenges--as each book does--it was the fastest I've ever written a novel. 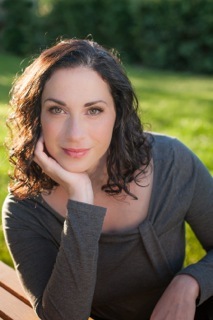 It was a different experience for me in many ways, however, because I was pregnant when I started writing the book. I had a wonderful amount of energy and focus (love those pregnancy hormones! ), and also the burning desire to get as much completed as possible before the baby arrived. I was a few days short of finishing my first draft when she decided to make her appearance. The rest was finished after she was born. I think with each book you learn more and you grow as a writer so you learn to recognize weaknesses early, and to question things sooner. I've also learned how to listen to my inner voice more when I have doubts about a plotline or a character. I think with each book I'm beginning to understand my own style more, what works for me, where my voice resonates the most, and what my fans also enjoy the best about my writing. Hopefully I can keep giving them that. You got the idea for your debut, Still Missing, in which a realtor is abducted from an open house, while working as a real estate agent yourself. Where do your subsequent creepy-terrifying plot concepts come from? Do you scare yourself with these stories? Never Knowing was the result of a conversation I had with my editor, a "what if" premise, which grew into a story. In Always Watching, I wanted to write about Nadine, the therapist in my first two novels, and I was intrigued by the debate about repressed memories and also the subject of cults. The cult in that book is inspired by a hippie commune that lived in Shawnigan Lake in the '70s. That Night grew from an idea I had while watching a true story on television about a man who served years for his girlfriend's sister's murder. I also "saw" Toni in my mind and wanted to write about her. Sometimes certain scenes in the books do scare me quite a bit. Essentially, I am telling myself the story first, so if I don't feel anything, then it's not strong enough. There are some moments in the current book I'm working on that are truly terrifying and made my own heart pound when I wrote them. Did you have to research the prison system? I did quite a bit of research for That Night. There seemed to be more information available about the American prison system than the Canadian, so I had to work hard to uncover some sources willing to talk to me. Because of the sensitive nature of the information they shared, they asked to remain private. I read everything I could find--online articles, books, memoirs, and watched both documentaries and numerous episodes of Lockup. Shauna and her gang are so mean, it's just boggling. Do they come from life--yours or anyone's--or are they a grotesque fantasy? I think we all remember "mean girls" in high school, but they are also a product of what I learned during my research. I read books on teen bullies and how girls can be especially vicious, often cutting another girl out of their circle, or simply deciding they don't like someone and then making their life hell. There have been many documented real-life cases where bullying has gotten completely out of hand, with deadly consequences. Sadly, a few young girls have even taken their own lives because they can't cope with the constant harassment. The worst part to me is that parents are often unaware of what's happening to their children at school. Toni's voice is convincingly teenaged in the passages set in her early life, and more grown-up in the post-prison passages. Did you make a conscious effort to vary her voice? Was it difficult to switch gears? I don't think it was conscious. Writing is a bit like acting sometimes, you go into the character. So when I was writing Toni's teenage years, I felt like a teenager, with a teenager's concerns and thoughts and hopes and dreams. Then, when Toni was older and released from prison, I wrote from a different mindset, imagining how it would feel to be in that situation, how it would shape you, harden you, how angry you would be at the system for failing you. Are you already at work on your next book, and can you share anything about it with us? All your books so far are stand-alones; any interest in the idea of a sequel? Yes, I am close to finishing my fifth novel. I'm not ready to share the title just yet. It's a superstition of mine that the book has to be finished first. But I will share that it's another standalone about three sisters who escape a terrible situation and go on the run, only to get caught in an even worse nightmare.